Shell has broken new ground in the oil business by developing a lead-free replacement for Aviation Gasoline (Avgas 100 and 100LL), subject to strict regulatory approvals processes. Avgas is one of the last transportation fuels that contains lead and is used by light aircrafts and helicopters. Shell has been developing the new lead-free oil for the past ten years through a series of extensive and exhaustive R&D procedures, and the last two months had seen the new product successfully pass the testing conducted by two original equipment manufacturers (OEMs), reports PR Newswire. Vice-President of Shell Aviation Xinsheng (Sheng) Zhang said the new product marked an important milestone for the company. Soon-to-be-replaced Avgas fuel contains lead in its formulation in order to meet fuel specification and enhance combustion performances (known as Motor Octane rating). The newly developed lead-free Avgas features all key Avgas properties and has a Motor Octane rating of over 100, which is an industry standard. Shell has worked long and hard to get to this stage of development, carrying out an intensive internal laboratory programme, including in-house altitude rig and engine testing. The company has collaborated with aviation engine manufacturer Lycoming Engines and the light aircraft manufacturer Piper Aircraft Inc. who successfully evaluated the new oil both in industry laboratory engine and flight tests. “Lycoming Engines commends Shell on launching its unleaded Avgas initiative,” said Michael Kraft, Senior Vice-President and General Manager of Lycoming Engines. 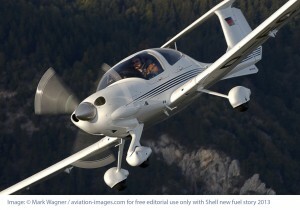 “Piper Aircraft is pleased to participate with Shell and Lycoming in this feasibility flight test programme,” said Piper Vice-President of Engineering Jack Mill. Shell will now engage the relevant authorities to achieve approval for the unleaded Avgas.